Kim Chacon, UC Davis doctoral candidate. This is a selfie she took at The Bee Course in Portal, Ariz. last August. Several UC Davis bumble bee enthusiasts--encouraged by native pollinator specialist Robbin Thorp, UC Davis distinguished emeritus professor of entomology--compete every January to find the first bumble bee of the year in Yolo and Solano counties. It's a friendly competition. Gamers include Allan Jones, Gary Zamzow, both of Davis, and yours truly. 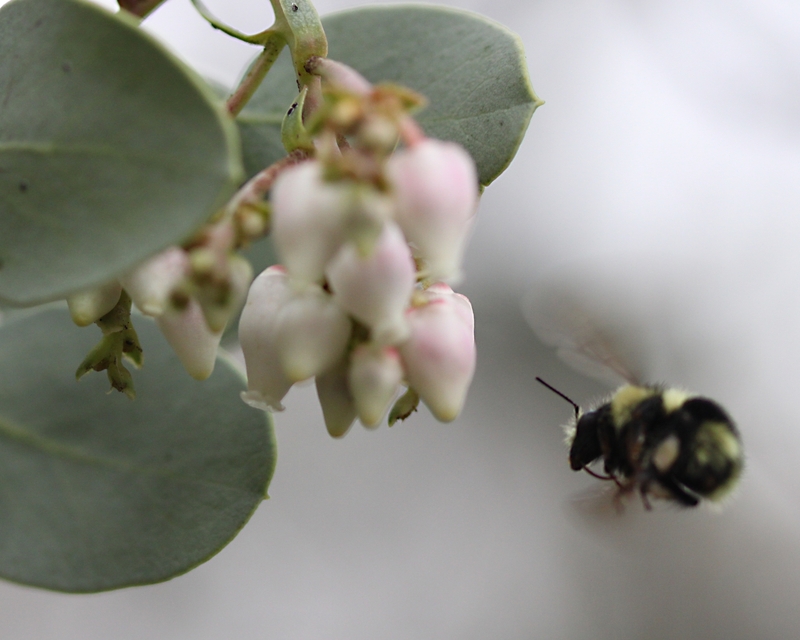 On Thursday, Jan. 10 doctoral student Kim Chacon photographed a black-tailed bumble bee, Bombus melanopygus, on manzanita blossoms in the UC Davis Arboretum and Public Garden. What a delightful find! And in between the rain drops! This species is native to western North America, ranging from California to British Columbia and as far east as Idaho. It's commonly found on manzanitas, wild lilacs, wild buckwheats, lupines, penstemons, clovers, and sages, among others. 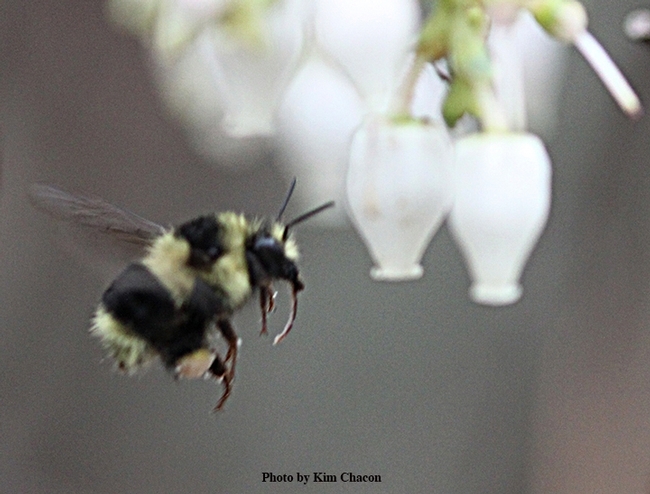 Chacon actually spotted an earlier bumble bee on Jan. 9 at 2:10 p.m. in the UC Davis Arboreutm, but had only her cell phone with her that day. It was a Bombus melanopygus on Arbutus in the Ericaceae section. She captured some images with her cell phone, but "there was a big downpour about 15 minutes and I didn't bring my good camera, so I went home for the day. I know from my research that this particular location in the Arboretum is a hot spot for bees. The banks and flowering vegetation get plenty of sun. There are three possible spots in the Arboretum, according to my research, and this one had blooming flowers first." This cell phone image, taken by Kim Chacon on Jan. 9, shows a bumble bee on Arbutus, family Ericaceae. Later she captured macro images of a bumble bee on manzanita on Jan. 10. 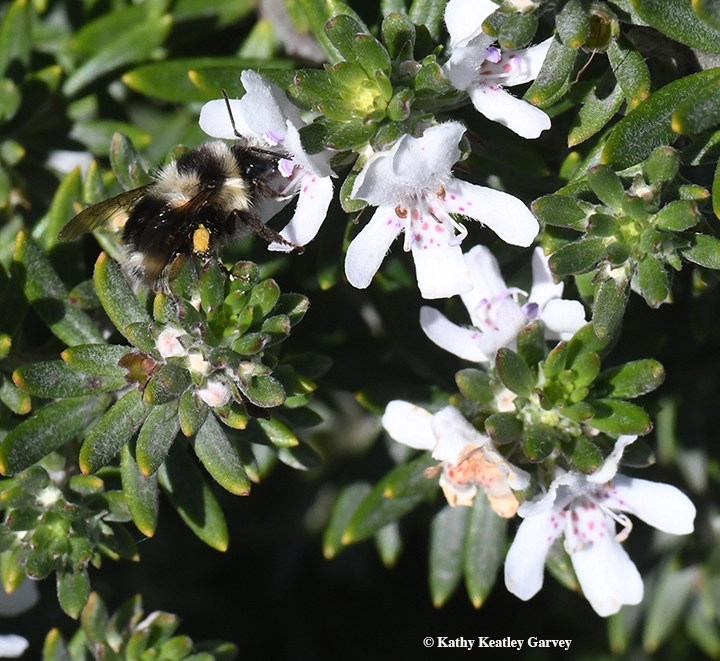 Chacon returned later in the day and saw a yellow-faced bumble bee, a Bombus vosnesenskii queen, on a manzanita on the walking path near Sandy Motley Park. Again, she had only her cell phone with her. 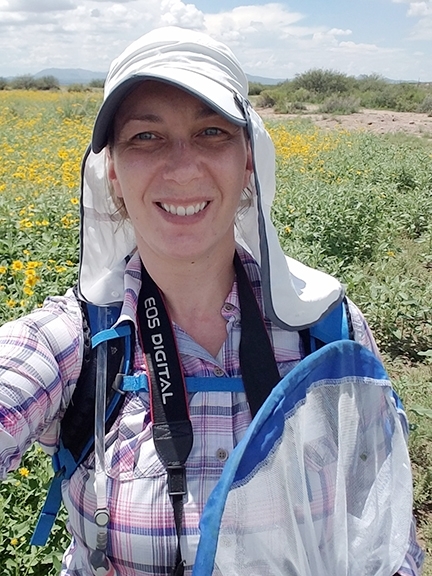 Chacon, a UC Davis PhD student in geography, studies "habitat connectivity issues for bees at a landscape scale." 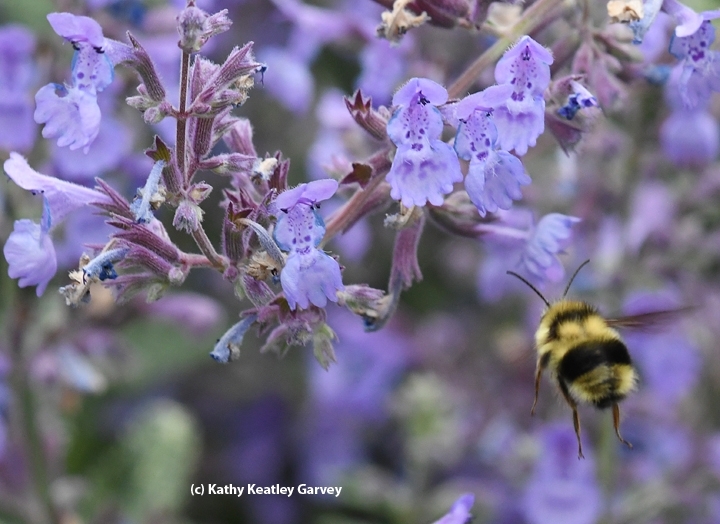 "Lack of habitat connectivity is listed as the main reason for native bee declines and yet, thus far solutions only include stand alone gardens, with randomly spaced unspecified plant species," she commented. "A spatial habitat problem such as destruction and fragmentation needs a spatial solution. I am working on solving this complex problem with the help of Geographic Information Systems (GIS). Part of my research involved weekly monitoring bee visitation of bees throughout the UC Davis Arboretum for one full year. I learned about the trends of bee-flower visitation within each unique themed garden, specifically, how they function as novel ecosystems. When I graduate I hope to design effectively connected landscape habitat for bees. 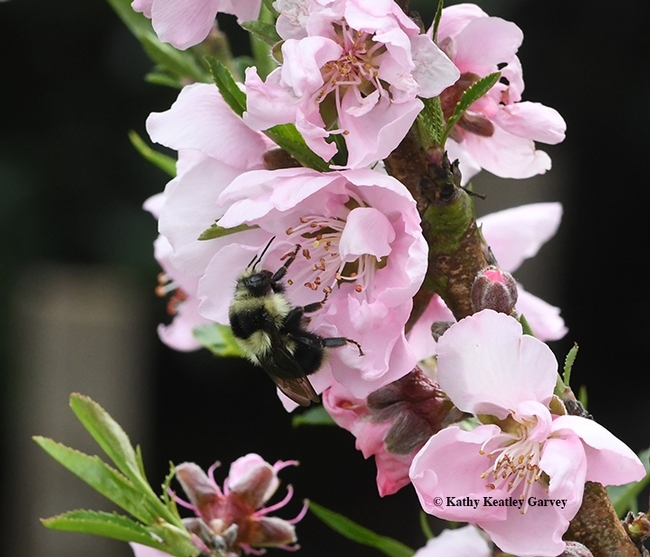 I would also love to design educational gardens, showcasing bee diversity!" 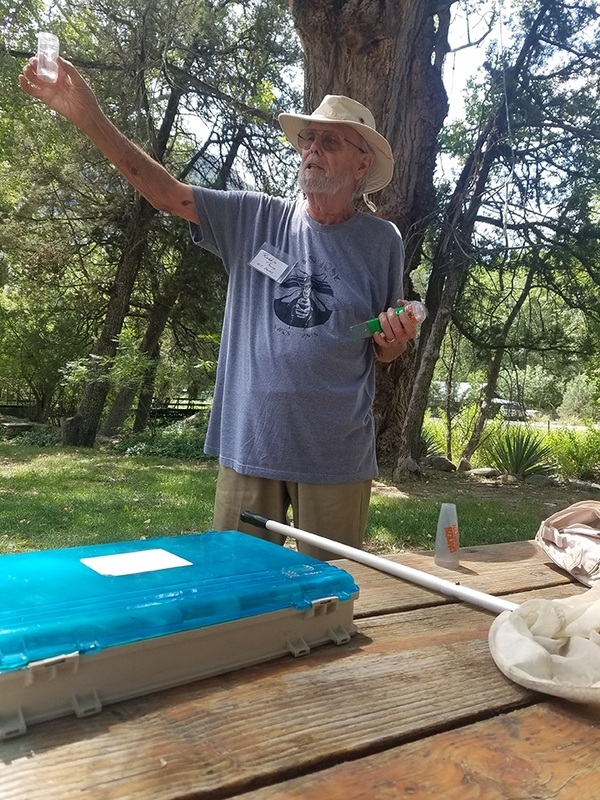 Chacon is a 2018 alumnus of The Bee Course, a nine-day intensive workshop affiliated with the American Museum of Natural History and held annually at the Southwestern Research Station, Portal, Ariz. It's offered for conservation biologists, pollination ecologists, and other biologists who want to gain greater knowledge of the systematics and biology of bees. This year's dates are Aug. 18-28, and the deadline to apply is March 1, 2019. Thorp is one of the veteran instructors of The Bee Course; he has taught there annually since 2002. A member of the UC Davis entomology faculty from 1964 to 1994 and internationally recognized for his expertise on bees, he achieved "distinguished emeritus professor" status in 2015. He co-authored the UC California book, California Bees and Blooms: A Guide for Gardeners and Naturalists (Heyday) and Bumble Bees of North America: An Identification Guide (Princeton University Press). 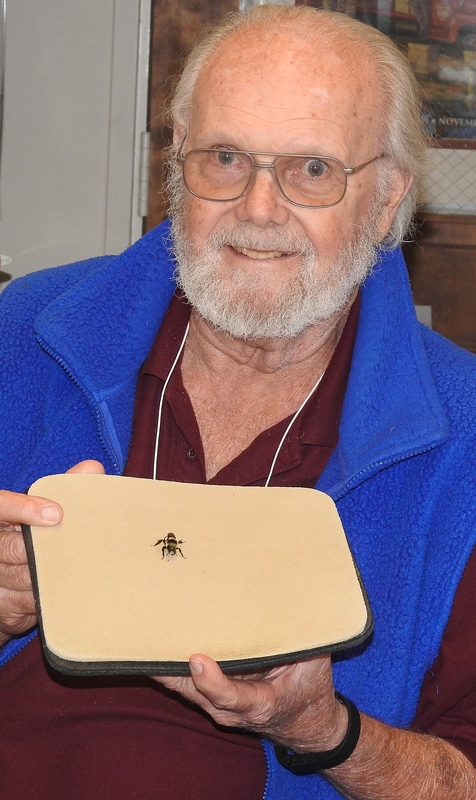 Thorp continues his research, writings and bee identification at his office in the Harry H. Laidlaw Jr. Honey Bee Research Facility at UC Davis. Today is the day we've all be waiting for--the first day of spring. 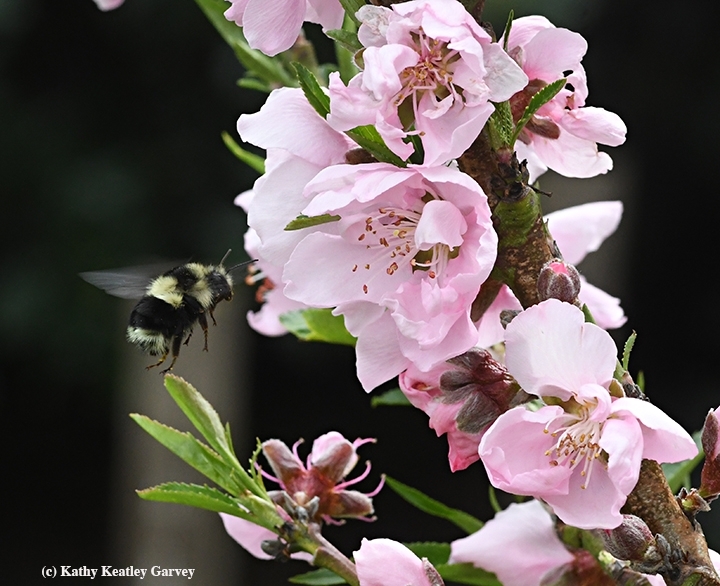 If you're lucky, you'll see bumble bees nectaring on spring flowers, including nectarine blossoms. 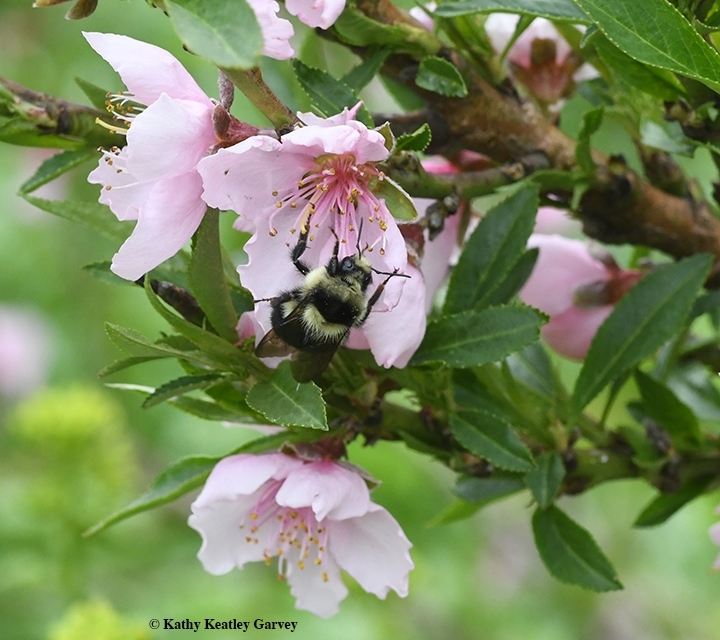 We spotted this bumble bee, Bombus melanopygus, also known as a black-tailed bumble bee, heading toward our nectarine tree and foraging on the blossoms. This is one of the 27 species of bumble bees in California. We frequently see the yellow-faced bumble bee, Bombus vosnesenskii, and sometimes Bombus californicus, aka the California bumble bee. If you're interested in learning more about bumble bees, check out the book, California Bees and Blooms: a Guide for Gardeners and Naturalists, the work of UC Davis and UC Berkeley scientists, including Robbin Thorp, distinguished emeritus professor of entomology at UC Davis, who is also the co-author of Bumble Bees of North America: an Identification Guide. Hey, honey bee, I'll race you to the flowers. Okay, but you'll lose. I can go faster. Watch me! The scene: a male bumble bee, Bombus melanopygus, and a worker honey bee, Apis mellifera, are buzzing along at breakneck speed toward the lavender in our pollinator garden in Vacaville, Calif. 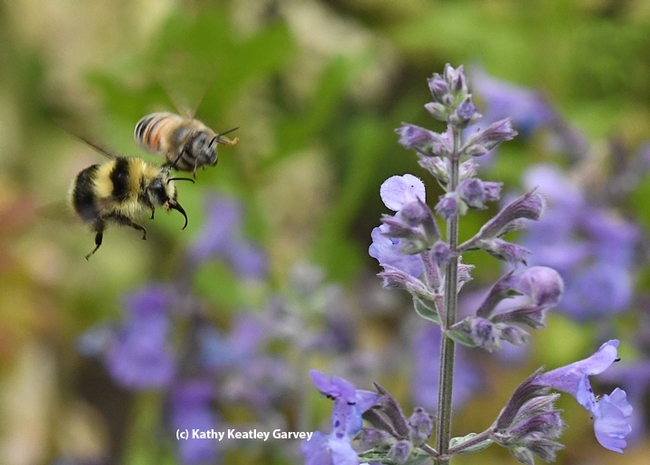 They nearly collide but Mr. Bumble Bee pauses in mid-air and gives Ms. Honey Bee a free pass---and just in time for National Pollinator Week, when all of our pollinators need free passes! 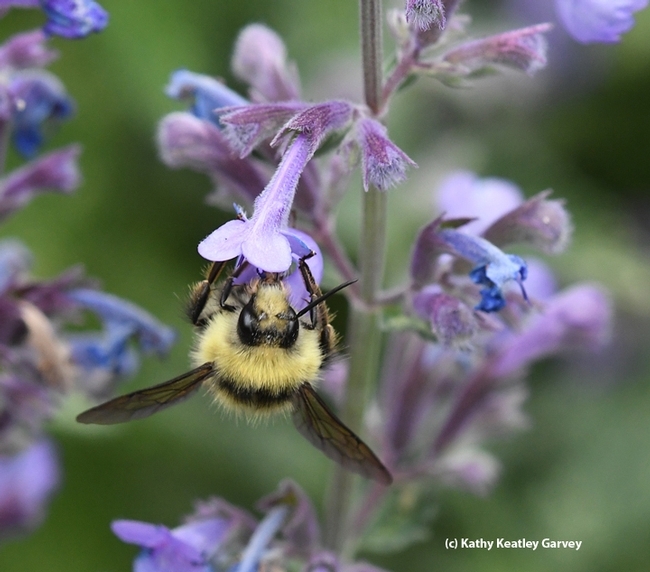 That starts out with two crucial steps: plant bee-friendly flowers and avoid using pesticides. Feed them food, not poison. The end result here: plenty of nectar for everyone. Bombus melanopygus, also known as the black-tailed honey bee, is among the bumble bees featured in the book, Bumble Bees of North America: An Identification Guide (Princeton University), the award-winning work of Paul H. Williams, Robbin W. Thorp, Leif L. Richardson and Sheila R. Colla. 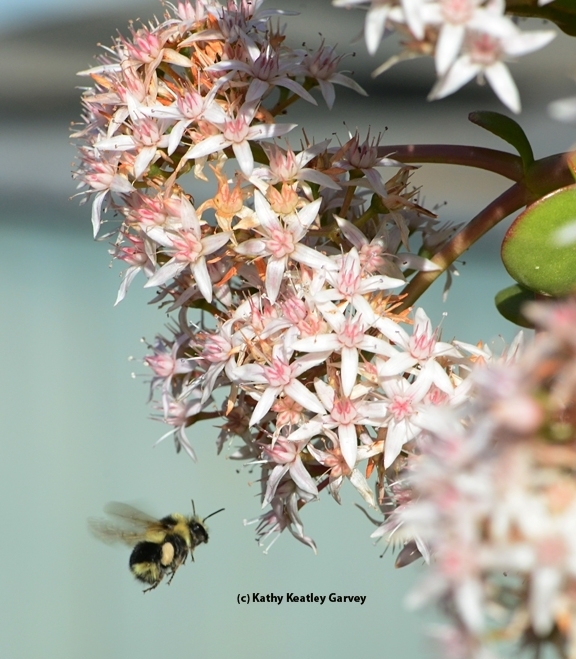 Thorp, a distinguished emeritus professor of entomology at UC Davis, is also the co-author (along with Gordon Frankie, Rollin Coville, and Barbara Ertter) of California Bees and Blooms: A Guide for Gardeners and Naturalists. They offer great information on bee identification, but also crucial advice on how to attract and retain bees in your garden. Native pollinator specialist Robbin Thorp, distinguished emeritus professor of entomology at UC Davis, greeted a visitor on Feb. 14 in his office in the Harry H. Laidlaw Jr. Honey Bee Research Facility. This visitor didn't talk, though. She buzzed. And she buzzed right over to his window. 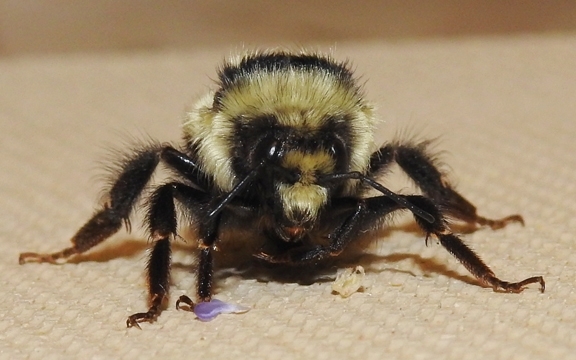 Well, hello, black-tailed bumble bee, Bombus melanopygus! "Guess all one needs to do is sit and wait," he wrote in an email to bumble bee enthusiasts. "Eventually a gyne will find her way into one's office. This one was buzzing against my window just a few minutes ago trying to get back outside." 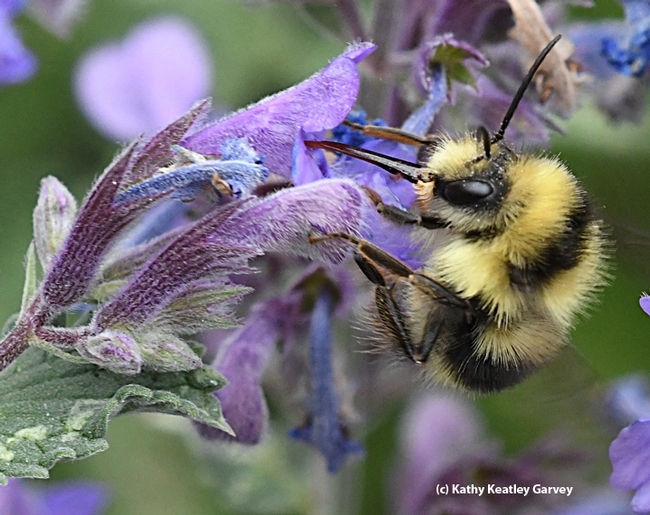 The black-tailed bumble bee, native to North America, is one of only 250 species worldwide in the genus Bombus. What's next with Thorp's bumble bee? 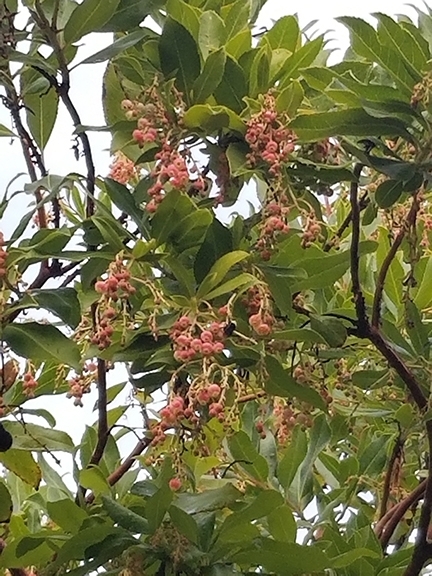 A nest box in an almond tree near the Laidlaw facility--feed her some honey, make her feel at home, "then let her fly out, hopefully to return and establish a nest." 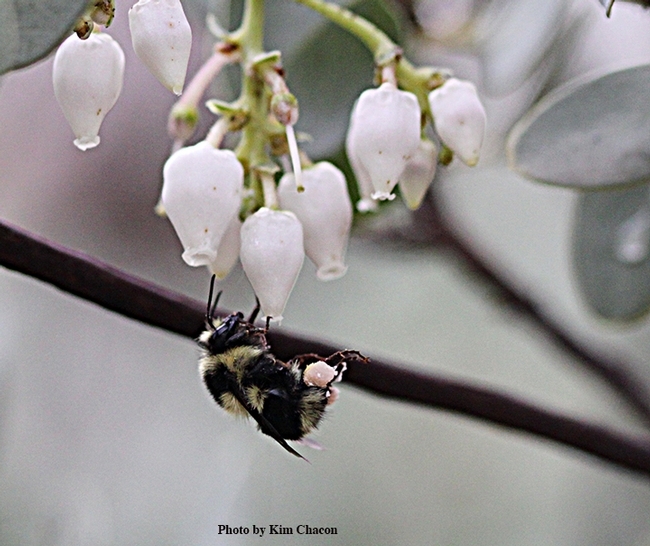 Insect photographer and naturalist Allan Jones of Davis discovered and photographed three Bombus melanopygus foraging on manzanita on Jan. 27 in the UC Davis Arboretum. 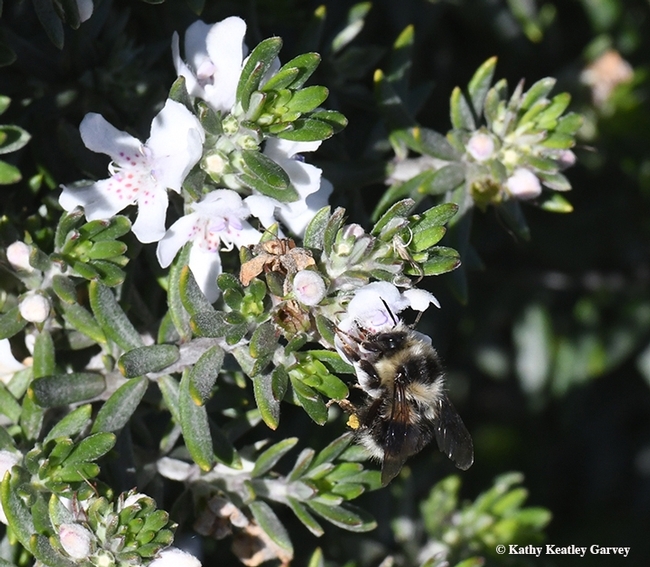 In doing so, he won the science-based, friendly competition among a small group of bumble bee enthusiasts in Yolo and Solano counties searching for the first bumble bee of the year.